AMD’s Ryzen Mobile Raven Ridge APUs have been a long time coming. And with their AMD Ryzen processing cores and AMD Vega graphics, they’re promising some serious performance improvements over their laggardly Bulldozer Bristol-Ridge predecessors. But, ah, it seems AMD are offering more than just any old iteration with their fresh-faced Ryzen Mobile APUs. Raven Ridge Ryzen Mobile APUs arrived in a few select ‘vanguard’ laptops by the end of 2017. Ryzen Mobile brings massive improvements over the last generation APUs. Thanks to Vega graphics and four Zen cores, the 2700U and 2500U have plenty of processing power. Pricing has still not been released for AMD’s latest co-processors, with previous models of the first Ryzen Mobile laptops ranging from $700 – $1000. The 2700U easily outperforms the last generation APUs from AMD in graphics performance, processing performance, and power efficiency. AMD’s Ryzen Mobile Ryzen 7 2700U and Ryzen 5 2500U are the first Raven Ridge APUs arriving, intended to power the slimmest ultrabooks with a little more graphical grunt. Desktop AM4 compatible chips are expected to eventually arrive onto the scene in early 2018. 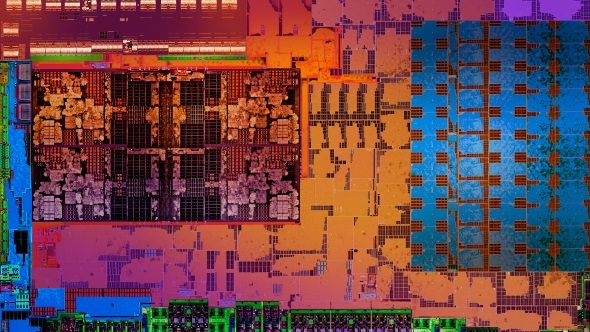 Seeming like an iterative APU generation at first, Raven Ridge is now being sold as a vast upgrade on previous generations, with AMD once again bringing the fight to the competition, since their success with their first Zen-core processors – Ryzen. With massive IPC (instructions-per-clock) gains thanks to the Zen cores included, AMD’s Ryzen Mobile chips are able to outperform their desktop-grade predecessors at a much lower TDP and lower clockspeeds. These are touted as ‘vanguard’ designs, so it is doubtful that many other OEMs will be launching products before the end of the year – likely waiting until the new year. The Envy x360 marks the first of three expected products launching as part of AMD’s ‘vanguard’ launch for their new Ryzen Mobile platform, promising huge gains over the APUs of the past. The 15” HP Envy 2-in-1 starts at $800, although you’ll have to pay a little more to remove its single-channel memory bottleneck and unleash all the performance that the Ryzen 5 2500U processor and eight Vega graphics cores have to offer. This processor runs out of the box at 3.6GHz boost clockspeed, although mobile XFR might be able to push clockspeeds up a little further if HP have kept the chip chilly. Lenovo and Acer are both launching Ryzen Mobile powered laptops to round off AMD’s vanguard launch. These also offer the beefier Ryzen 7 2700U APU, with the full ten Vega graphics cores and 3.8GHz boost clockspeed. Ryzen Mobile will be available in two options, the top-tier Ryzen 7 2700U, and the Ryzen 5 2500U. The Ryzen 7 2700U features four-cores and eight-threads, with ten Vega Compute Units. The Zen chips on the board will run at a base clock of 2.2GHz, and a boost clock of 3.8GHz. The Ryzen 5 2500U features the same processor core count and thread count, at four and eight respectively. This processor will however only feature eight Vega graphics Compute Units, and will run at a base clock of 2.0GHz, and a boost of 3.6GHz. Both processors are expected to have a TDP of 15W. 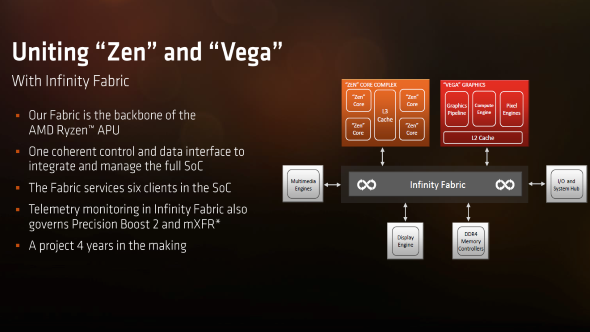 At the core of the Ryzen Mobile processors is AMD’s Infinity Fabric, the same one used within Threadripper. 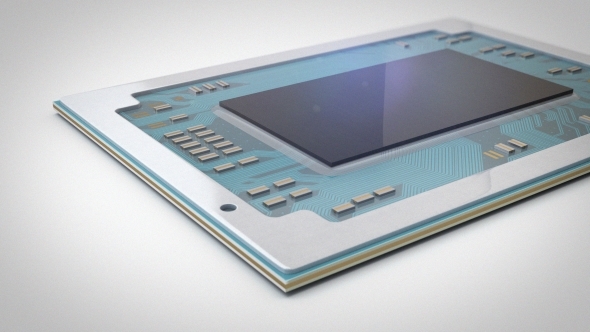 This allows six modules within the chip to communicate with each other, and also allows for advanced monitoring required by AMD’s enhanced SenseMI technology. 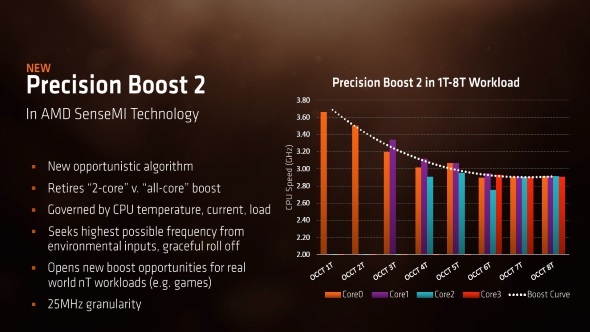 AMD have updated their CPU frequency boosting tech to the aptly named Precision Boost 2. This allows clockspeed to gradually decline as greater thread counts are utilised by the processor, rather than the steep step down featured on the first iteration of Precision Boost, allowing for higher clockspeeds on average with multi-threaded applications. XFR also gets a mobile doppelganger with mXFR. Working alongside specific OEMs, AMD are aiming to provide laptops with more than capable cooling solutions to maintain boosted clockspeeds over their warmer counterparts. 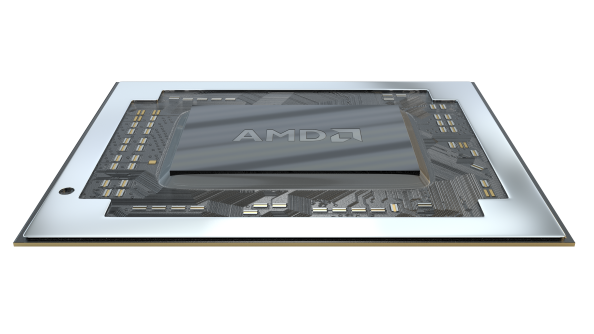 Through a number of optimisations, AMD are touting improved battery life over the previous generation FX 9800P APU, especially in VP9 encoded video playback, in which Ryzen Mobile more than doubles potential battery life. Improvements were not quite as significant in H.264, with the 2700U managing to improve battery life from 10.6 to 12.2 hours. 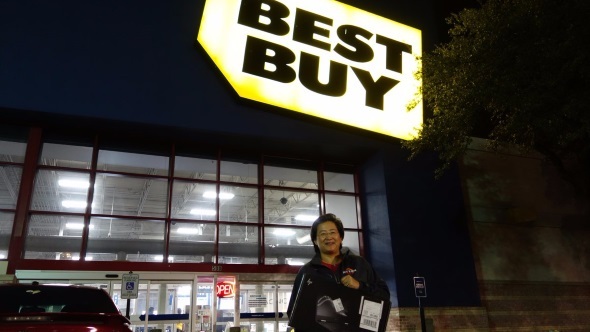 MobileMark 14 saw an increase from 10.7 hours on the FX 9800 to 13.5 hours with the 2700U. Under real-life testing, these scores may read pretty differently, with laptops likely managing significantly varied hours of use between them. The three laptops that AMD have announced – the Acer, Lenovo, and HP – are between $700 – $1000 (£600 – £800), so expect prices for full systems to arrive with a similar price tag. HP also offer their Envy x360 for Intel fans, featuring an i7 8550U and only the UHD 620 integrated graphics on the chip. With potentially near-identical setups, performance, and power efficiency, benchmarking between the AMD and Intel models will be the real make or break moment for AMD’s latest APU. Either way, the Intel has seemingly had a reduction in price from $930 to $730, so it seems Ryzen is already beginning to shake up mobile pricing as it did for the desktop. Most likely cheaper models will arrive early next year, although they may only feature single-channel memory, which has been a serious bottleneck for APU performance in the past. AMD have been targeting three key areas for their upcoming APUs. 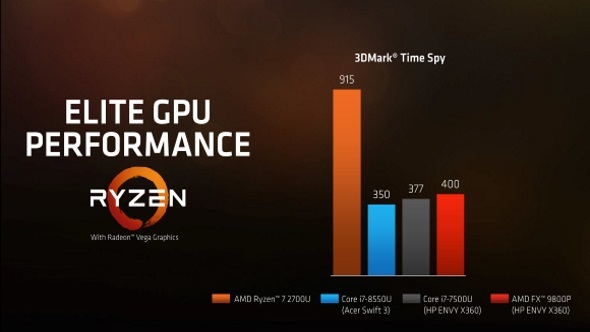 These are unsurprising: CPU performance, GPU performance, and efficiency. 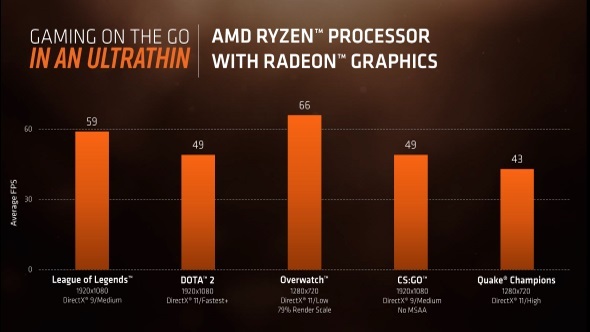 AMD look well on their way to hitting their lofty goal of 25x efficiency over Kaveri by 2020, and smashing some graphics and processing targets along the way. Mobile chips often exist in their own universe, benchmarking far beyond the dark realms of desktop chips past – but no more! 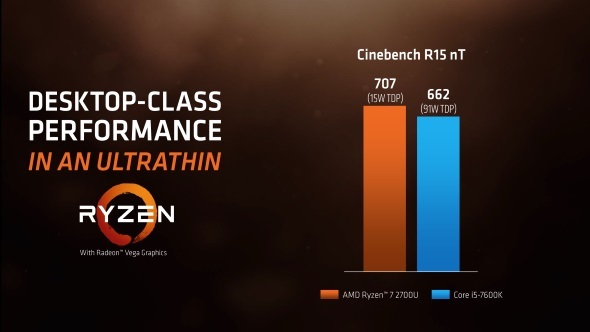 In AMD’s own Cinebench R15 testing, the Ryzen 7 2700U APU scored 707 points in Cinebench R15 (multi-threaded), compared to Intel’s last generation Core i5 7600k processor’s score of 662. Both feature parity on core count – at four cores, eight threads each – although the Intel desktop chip runs at a 91W TDP, so this is quite the accomplishment for the plucky little 15W APU. In single-threaded tests, Intel’s eighth generation i7 8550U still managed to edge Ryzen Mobile, yet only by a score of 159 to 144, respectively. In multi-threaded, yet again, the Zen chip took the lead by 719 points to the i7 8550U’s 498. Compared to AMD’s seventh generation APUs, in PCMark 10, the 2700U scores 163% better. In TrueCrypt 7.1a encryption software, the latest Raven Ridge APU performs a whopping 249% better, although this program was discontinued in 2014 so it is a bit of a far-reach for real life performance. In POVRay 3.7, PCMark 10, and TrueCrypt 7.1a, the Ryzen Mobile 2700U outperformed the Intel i7 8550U, only losing out in PassMark 9 benchmarking – at 176% to Intel’s 188%. The 2700U unabashedly rules over integrated graphics solutions currently on the market, no doubt thanks to its Vega graphics cores, posting a score of 915 in 3DMark Time Spy. For comparison, AMD’s last generation FX 9800P APU scored 400, Intel’s i7 8550U scored 350, and Intel’s i7 7500U scored 377. For gamers, the 2700U offers certainly playable frame rates at 1080p in some of the most played titles, although AMD were testing these titles with dual-channel memory – which is often not available among OEM laptops. In League of Legends at 1080p, and at medium settings, the 2700U reaches an average of 59fps. In Overwatch, the APU pushed an average 66fps, although requiring 720p, 79% render scale, and low graphics settings to do so. For games like Dota 2, and CS:GO, however, the ten Vega cores seem more than capable, scoring 49fps on both titles at 1080p. These Ryzen Mobile chips most certainly won’t be able to run the latest titles at maximum graphical settings. However, they perform particularly well for an APU that is only 1.38mm thick for use in – mostly productivity driven – ultra-thin notebooks.